It is January 1st and we hope everyone had a safe and enjoyable holiday season. We were home for all of December enjoying the unseasonable warm weather. In our 21 winters this has been the warmest ever. There were only a couple of nights that approached the below zero mark. I am just hoping we do not pay for this nice break later on this winter. The Winter Fest will be coming up soon so we at least need some more snow for the sculptures in the park. Around the resort we have begun a few of the renovations, well at least the demolition part of the projects. 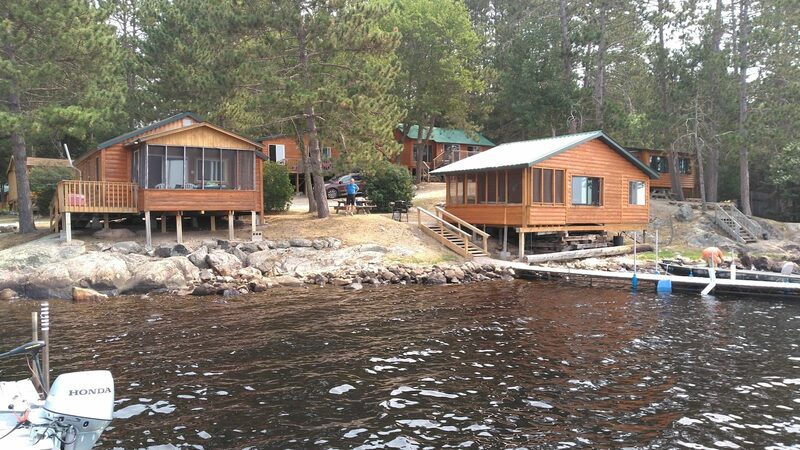 So far we can get around to all of the cabins without much trouble so work continues. Unfortunately the days are pretty short this time of year so after spending a few hours in the real estate office there is not a lot of time left. Our sport show season begins this month starting with Schaumburg Illinois. Only doing the 4 shows is not real taxing and actually enjoyable versus the 12 or more shows we did each season many years ago. Please plan to attend one and stop by for a visit. At the shows this year we are handing out info that could win you a free week to WIBR. Below are the dates for this year’s shows. We finally have ice thick enough to fish safely on most but not all area lakes. As of today I would not venture out on Burntside, Miners or any lake or river where there is a possibility of flowing water. We were able to get out a couple of times. Once to a very small lake down Highway One. It was supposed to be one of those secret lakes. Well it must have been secret to the walleyes too as we did not catch one. We did have a bit of luck on Shagawa. A few walleye and a couple of smaller Northern. We are also minus one ice fishing combo rod and reel. Moral of that story is someone should be outside the shelter paying attention, which we were not. Plop, plop fizz, fizz there it went with what had to be a decent fish. Trout opener inside the BWCAW opens today. Again, many of the best trout lakes are those that have poor ice so be careful. Hopefully by the non BWCAW trout opener in a couple of weeks the lakes will have enough ice for safe travel. If you are interested in permits for Basswood or South Farm Lakes please click the link below for more info.